Yes, it’s true, “‘ish,” more commonly known as “fish,” is one of Masher’s favorite foods, just as it was mine when I was little. My favorite version, of course, was the crappie or bluegill Dad and I would catch in the lake out back, or the catfish from the pond on Grandpa’s farm out in western Virginia, battered and crisped in the deep fryer with some kind of oil that we had been reusing for about a century. Luckily I have not inherited the deep fryer (as yet), and I don’t reuse cooking oil (although I can still taste a batch of french fries my mom made with that fish cooking oil when I was about 10 years old — YUM, if you like fish! ), but I still have a passion for fried fish. Fish at our house is a quick and easy meal, so I generally don’t bother with using an egg bath before I roll the fish in flour or cornmeal and pan fry it — the bath is just too messy and adds unnecessary minutes. Unfortunately, as a result, my fish generally isn’t as crispy as it could be. To the rescue, garbanzo bean flour! I had bought the garbanzo bean flour on a whim and didn’t have any other plans for it … Why not try it out as a fish crust? After salting and peppering the fish (catfish in this case), I dipped it in the garbanzo bean flour, which immediately began to stick thickly on the fillets in a way that regular flour just doesn’t do. In the pan, both sides, for just a few minutes, and what do you know? Delicious, and super-crispy, pan-fried fish. 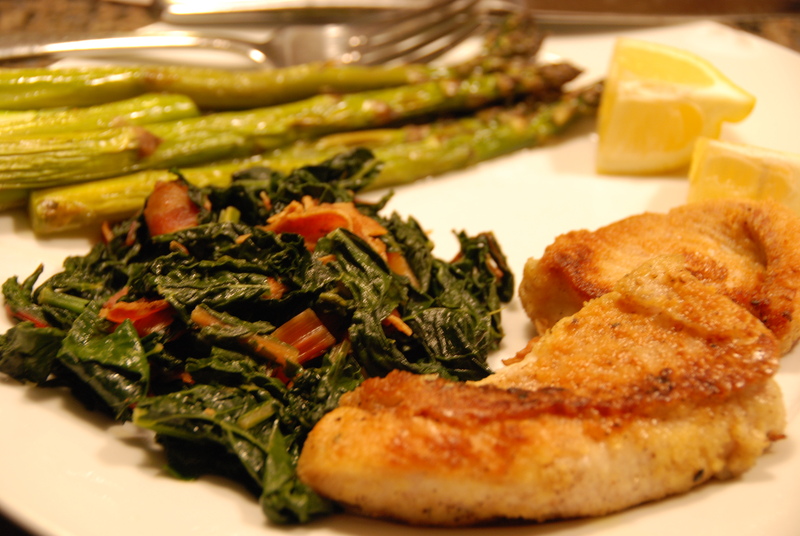 I served the fish with some kale and mustard greens quickly sauteed with a bit of bacon and some broiled asparagus. Josh actually called this his favorite meal of all time. I thought the veggies turned out a bit on the greasy side, but I won’t deny it was delicious all the same. Try it out!